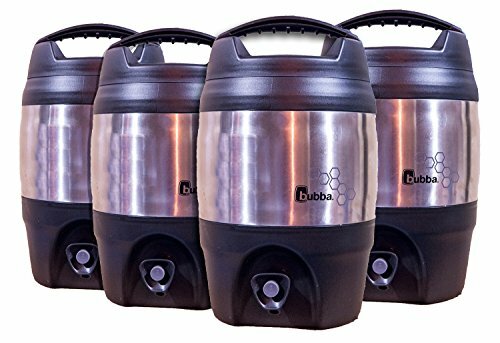 The Sqwincher 600105 Bubba Keg plastic/stainless steel personal cooler with handle is an insulated beverage container that holds up to 1 gallon of hot or cold liquid, with two walls surrounding a foam insulation layer to help keep beverages hot for up to 3 hours and cold for up to 12 hours. The cooler is made from plastic that does not contain bisphenol-A (BPA) and corrosion-resistant stainless steel for durability. It has a built-in pour spout for dispensing beverages, and an attached handle for portability.